For other uses, see Dikson. 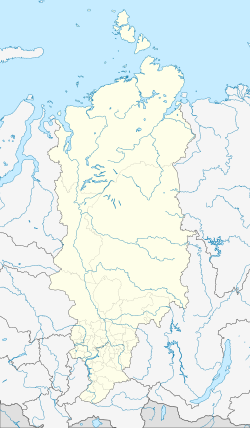 Dikson (Russian: Ди́ксон, IPA: [dʲiksən]) is an urban locality (an urban-type settlement) in Taymyrsky Dolgano-Nenetsky District of Krasnoyarsk Krai, Russia. It is a port on the Kara Sea, located on a headland at the mouth of the Yenisei Gulf (the Yenisei River estuary), on Russia's Arctic Ocean coast. As of the 2010 Census, its population was 676. Dikson is the northernmost port in Russia, one of the northernmost settlements in the world, and the northernmost settlement on the Asian continent. It is located so far north that one may experience complete darkness with no civil twilight from the 8th of December to the 5th of January. In most major settlements north of the Arctic Circle, there is still substantial twilight during the polar night at midday. It is also one of the most isolated settlements in the world. Dikson's inhabitants informally call their settlement a "Capital of the Arctic", a name taken from a popular Soviet song. The urban-type settlement of Dikson, as well as Dikson Island, were named after Swedish Arctic pioneer Baron Oscar Dickson. Dickson, along with Aleksandr Mikhaylovich Sibiryakov, was the patron of a number of early Arctic expeditions, including Adolf Erik Nordenskiöld's Russian Arctic explorations. Unlike the rest of Russia, children under the age of 12 make up 20% of the population. In the rest of Russia, this number is 15%. Located in northern Eurasia and above the Arctic Circle, Dikson has a tundra climate (Köppen: ET) where the arborea vegetation is unknown. Yet for a polar climate it is relatively moderate, similar to coastal Antarctica. Its climate is like a semiarid (below 350 mm) but covered with ice and snow. Pitch precipitation is in dry form. Usually in these climates the warmest month has most of the days with temperature below 10 ° C, however in some occasions the city can have fresh summers instead of cold, with temperatures between 15 to 18 ° C. For most of the year the temperatures are below freezing which results in long and rigorous winters. Liquid precipitation is concentrated in the summer, late spring and early fall. Temperatures have already risen to 26 ° C but there is no record of temperatures below -50 ° C as in much lower latitudes due to marine moderation. The place is known for the most pronounced climate changes. Where the highest temperatures in the Arctic have been recorded, correlated with the melting of the permafrost and the melting of the sea. It too is known as the place of the fastest warming since the records of the last decades. ^ Barents Observer. "The dogs protect us from polar bears". ^ "Dikson, Russia Köppen Climate Classification (Weatherbase)". Weatherbase. Retrieved 2018-12-19. ^ "The Typical Weather Anywhere on Earth - Weather Spark". weatherspark.com. Retrieved 2018-12-19. ^ "This place on Russia's Arctic coast has most dramatic climate change". The Independent Barents Observer. Retrieved 2018-12-19. ^ Staalesen, Atle; Observer, The Independent Barents (2018-10-03). "Arctic coastal town of Dikson is fastest-warming place in Russia". Eye on the Arctic. Retrieved 2018-12-19. ^ Погода и Климат – Климат Острова Диксон (in Russian). Retrieved October 3, 2009. ^ "Climatological Information for Dikson, Russia". Retrieved August 31, 2011. This page was last edited on 21 December 2018, at 16:48 (UTC).